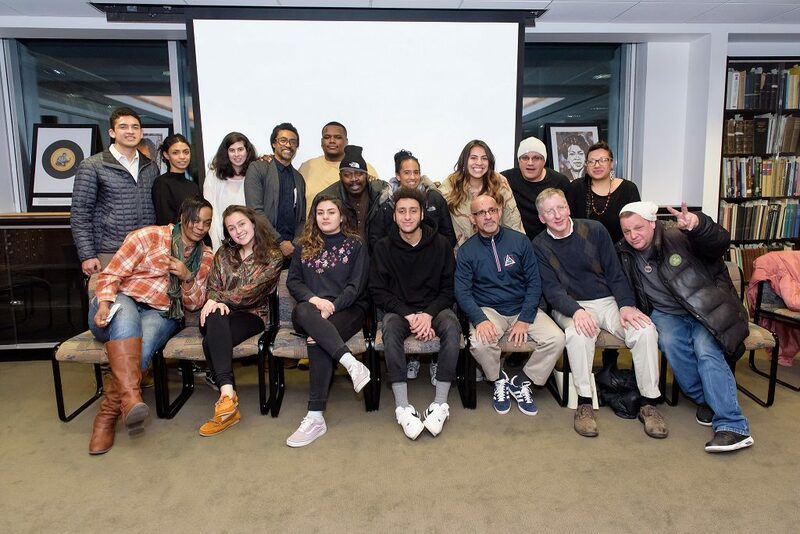 Hartford Hip Hop pioneers, Trinity College students, Trinity professor Seth Markle, former Peace Train Breaking and Popping All-Stars manager Tim Wolf, and Hartford History Center team member Jasmin Agosto for screening of Hartford Hip Hop Digital Stories on February 13, 2018, Hartford History Center, Hartford Public Library. To get a preview of the images and learn more about the scene, check out our featured Peace Train Breaking and Popping All-Stars photo essay in CT Explored’s 2018-19 Winter Issue and our Hartford Hip Hop digital stories project in partnership with Trinity College. Dooney Bates of Master Poppers solos during Peace Train’s Breaking & Popping Contest. Thursday, February 7, 6:00-7:30 p.m.
View photographs, flyers, newspaper articles, and footage from Hartford’s early hip hip scene, with a particular focus on the 1970s and ’80s arts organization Peace Train’s Breaking and Popping All-Stars and hip hop exhibitions that were curated at Real Art Ways in 1981 and 1991. Hip Hop is a global arts movement that was started by African American and Latino youth in 1973 in the South Bronx as a response to the criminalization of youth, the lack of quality education supports, and the burning down of their dilapidated housing neglected by property owners and the New York City government. These young people took their situation and flipped it into dance, visual arts, and music, which they shared at community block parties to tell their stories and express their realities. This community-rooted creative process resulted in the minimizing of gang culture, transforming the violence of the streets into playful dance and rap battles. Afrika Bambaataa of the Universal Zulu Nation pulled the elements of the culture together, including DJing, emceeing (rapping), bboying (breakdancing), graffiti, and knowledge (self-awareness, history, philosophy), to formalize and unify the culture under the term hip hop. Hip Hop culture emerged in Hartford in the late 1970s and early 1980s in neighborhood landscapes similar to those of the South Bronx. An exhibition at Real Art Ways in 1981 brought young up-and-coming New York City-based graffiti artists Lady Pink and Crash to paint on Real Art Ways’ (RAW) State Street Hartford walls. RAW, founded in 1975 by four Hartford-based avant-garde artists in music, visual art, and film, is today one of the nation’s great venues for contemporary art. A portion of RAW’s archives have been donated to the Hartford History Center, and RAW assisted the Hartford History Center in locating images, footage and newspaper articles that provide insight into RAW’s promotion of hip hop events. 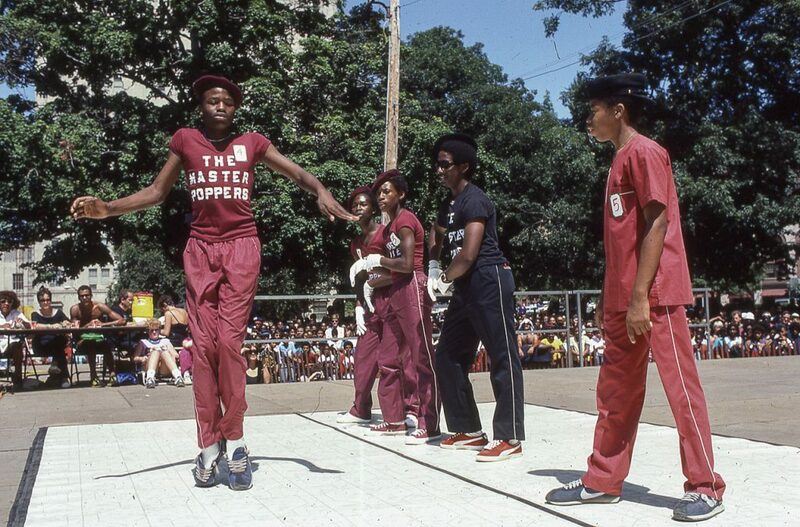 Tim Wolf, formerly of Peace Train, shared photographs, fliers, and recordings documenting the early 1980s bboying (breakdancing) and popping community in Hartford. Peace Train was a Hartford-based organization that produced large-scale concerts during the 1970s and 1980s. 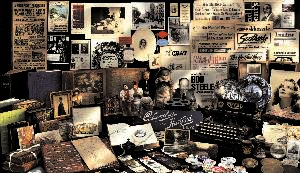 The Hartford History Center at the Hartford Public Library would like to thank our partners at Real Art Ways and Tim Wolf for their help with this exhibition.